Brisbane Duo 416 has played all over Australia, and abroad, and are currently one of the top live party duos in the country. Brisbane Duo 416 is an exceedingly talented duo, very experienced, and due to their vast song repertoire of more than 600 songs, they have a major advantage over other acts, in their ability to entertain any type of audience of any age spread with this wide selection of tunes at their disposal. Their song styles include virtually everything – party, pop, rock, soul, disco, jazz and even dinner music when required, plus many recent dance floor smash hits as well, which always keeps the dance floor packed all night long. The band comprises of both male and female vocals, with guitars, drums, as well as exceptional quality backing tracks for the other instruments in the bigger hit songs. Brisbane Duo 416 has played hundreds of wedding performances over the years, plus a huge multitude of high-profile corporate events and functions all over the world, and is amongst the most regularly booked live bands in Queensland. The duo has great vocalists with a natural ability to entertain with humour and style, and the large stage experience they have gained over the years means they always know how to deliver perfect results in any situation. Brisbane Duo 416 also provide excellent dance floor Ipod music during their breaks, to make sure the dance floor stays busy while they’re taking a break. Brisbane Duo 416 provides a fabulous state-of-the-art, modular sound and lighting system, which can be set up in just under 30 minutes, so there’s nothing for you to do – just sit back and enjoy a hassle-free evening of world-class professional live entertainment! Listen to just how incredible they sound by clicking on their MP3 song links. A very good act, for your very good event! Shake Your Tailfeather – The Blues Brothers! You guys were one of the highlights of our wedding! I don’t think anyone sat down for the whole first set, and they only had a rest in the second because they were worn out! You sounded fantastic, joined in with the crowd, and changed things up later in the night when everyone started making requests. So many of our guests have since commented that you were the best live party band that they’ve seen. 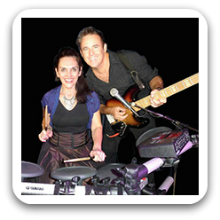 We are definitely recommending you to anyone who needs a fun, talented, and entertaining band. You were the soundtrack to the party we’d hoped for!